When you’re in the mood for a sweet treat, you want something homemade and delicious. Oklahoma has just what you’re looking for. Here are 10 different bakeries from around the state where you can find delectable goodies when you want to feel like you’re a kid again raiding your grandma’s cookie jar. Since 1977, Ingrid’s has been baking up delicious pastries, breads, bagels and cookies right in their own kitchen. The cheddar, onion and garlic bagels have always been a favorite. The cakes are unbeatable. 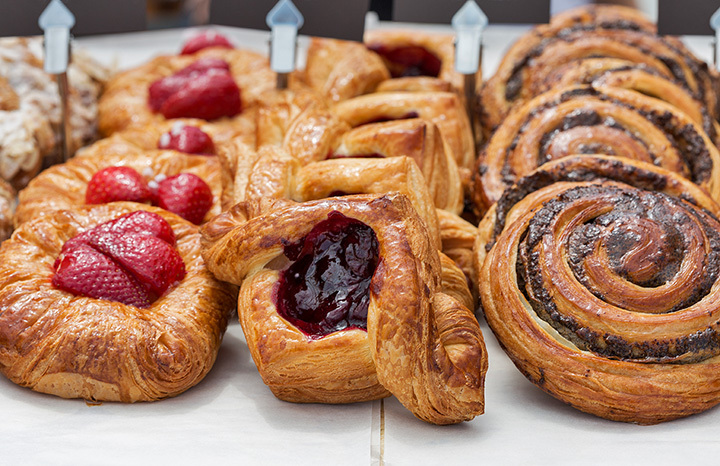 Make this your go-to stop for Danishes, pies, and sweet breads. On one end of the Cheese House, there’s a small bakery that offers bread, pies, cakes and pastries that are made from scratch right in the store. The carrot cake tastes as if your grandma made it herself. The sign outside says “Ol’ Dutchmen’s Bakery,” and no matter what you call this place, it’s always good. The cinnamon rolls and pies are fresh. You can also get smoked meats and other goodies, including some gluten-free options when you stop by this little business on Route 66. Belle Kitchen has been named the home of Oklahoma’s best donuts, but the other pastries are divine. Fresh whipped cream fills the homemade eclairs. Macarons are made every day in many different flavors. Ann’s has been a staple in Tulsa for more than 75 years. A few years ago, a fire caused Ann’s to shut down for a year. Food Network’s “Save My Bakery” came to the rescue and helped the bakery find a more stable footing. It’s back to baking wedding cakes, pastries and breads. La Baguette multiple locations where you can find the best French bread and pastries around. Don’t forget to try the crepes and other sweet treats the company bakes daily. Yeast and quick breads are made fresh daily in this fairly new business in Stillwater. It opened in 2005 with the goal of providing the best and freshest food at the best price. And it delivers. Johnson’s Bakery is known for its shortbread cookies, but you’ll want to buy up every type of bread and pastry they have in the display case when you come. The aroma draws you in, but the tastes keep you coming back. Harmony House was once mentioned in “Southern Living” for having Oklahoma’s best cookie. For over 21 years, this bakery has been providing specialty pastries and clover rolls that are baked fresh every day. Another great place for cupcakes, cookies and bars, right off Route 66 on the western side of the state. You can even customize your cupcake at the Creation Station. Start with a wedding white, rich chocolate or buttery yellow cupcake, then pile on the toppings and icings to fit your mood.